In the age of rapidly advancing technology and constantly evolving work-life balance priorities, workers expect more flexibility than ever before. And, given the current talent crunch many businesses are facing, companies that do not embrace at least some flexibility may end up a casualty of the talent war. So, for many companies trying to attract and retain top talent, creating a more flexible work environment may be the key. Here are four of the more popular flexible work arrangements, along with a few pros and cons of each. 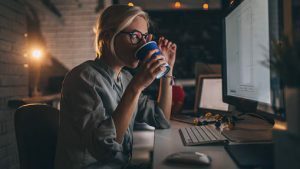 One of the most common flexible work arrangements, telecommuting allows employees to work from home or other locations outside of the office via email, telephone, and/or internet. Pros: Better work-life balance, employees are more focused and efficient without the distractions of a busy office. Avoiding long commutes. Employers may not need to maintain as much office space. Cons: Less interaction between coworkers, including fun or teambuilding opportunities. Employers have less oversight over how employees are managing their time and staying on task. In most cases, businesses require employees to be in the office during a “core” period (i.e 10:00 a.m. – 3:00 p.m.) However, during the hours outside that period employees choose their own schedule. Pros: Freedom to schedule work around life and family events. Employees have more freedom to work when they feel the most productive. Employers can better address peak or odd business hours. Cons: Similar to telecommuting, face-to-face time with coworkers is reduced. Complicated logistics of keeping track of everyone’s differing schedules. Opportunities for employees to abuse the privilege. In this arrangement, employees “compress” a full 40-hour work week into fewer than the standard five days. A common example would be working four 10 hour days Monday – Thursday with Fridays off. Pros: Extended hours during busiest workdays. Employees have more time away from work to pursue personal interests. Cons: Longer work days can be more grueling. Employees may find it difficult to arrange childcare during atypical hours. Vendors and other outside contacts likely still work a traditional work week. Job sharing involves two employees who work on a part-time or reduced hours basis to perform a job that is typically performed by one employee working full time. Pros: The two employees’ skills may complement each other, creating more well-rounded performance. Time off can be staggered so the position is always covered. Employees have better work-life balance. Cons: Inversely, the two employees may not be compatible and work slips through the cracks. Pay and benefit structures in such an arrangement can be more challenging for employers. In the end, the type of flexible work arrangement a company implements—if any at all—comes down to their individual business needs. What works for one workplace may not be suitable for another. However, no matter which arrangement you choose, communication with employees is vital in order to ensure everyone benefits.